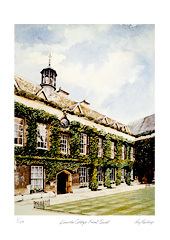 Lincoln College was established in 1427 by Richard Fleming, the Bishop of Lincoln and Oxford’s diocesan bishop. At first it housed only the Rector and seven graduate fellows and was dedicated to promoting religious orthodoxy. The site on the east side of Turl Street was formerly occupied by the church of St. Mildred and the new entrance range was started before Fleming died in 1431. Fronting the street are two storey 15th century stone buildings with a low tower above the gateway. The gateway to the right leads into the Chapel Quad, started in 1608. The front of these quads was remodelled in the 19th century and many of the original small windows in these buildings have been replaced.